as construction is now underway for a new, 58-unit affordable-housing community at historic Fort Snelling. 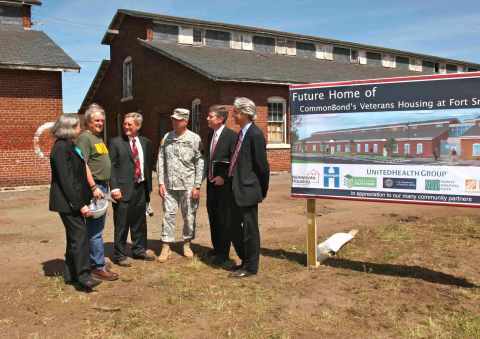 Veterans groups, project partners and various community leaders heralded CommonBond’s Veterans Housing at Fort Snelling as vital in helping reach a goal of ending homelessness among military veterans in Minnesota. According to Heading Home Minnesota, a public-private partnership to end homeless in the state, more than 10,000 Minnesotans are homeless on any given night, including more than 350 veterans. Today’s ceremonial groundbreaking event coincided with the conclusion of National Military Appreciation Month.